The easy to use, hard drive diagnostic software. Also has limited support for external HDDs or SSDs. Only $25 for a personal license! 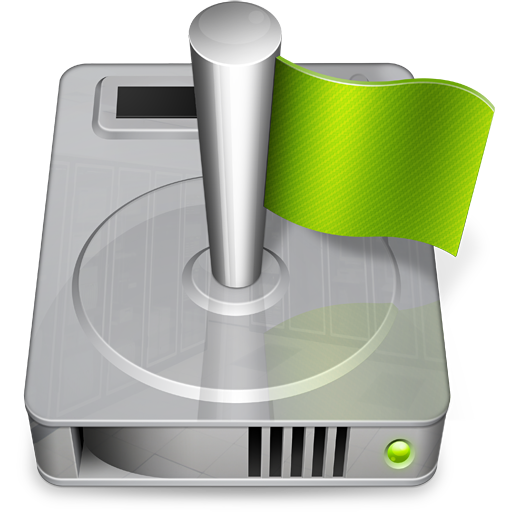 SMART Utility is an application to scan the hardware diagnostics system of hard drives. 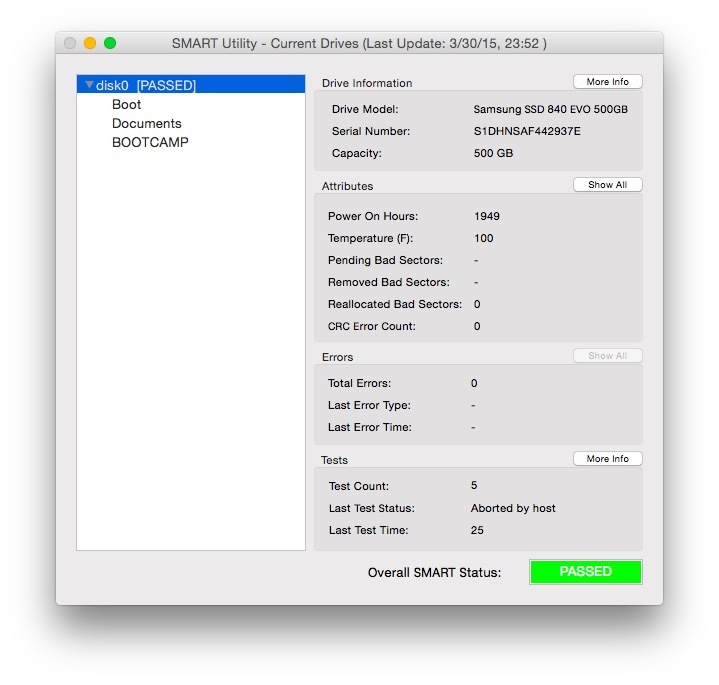 SMART (Self-Monitoring, Analysis, and Reporting Technology) is a system built into hard drives by their manufacturers to report on various measurements(called attributes) of a hard drive’s operation. 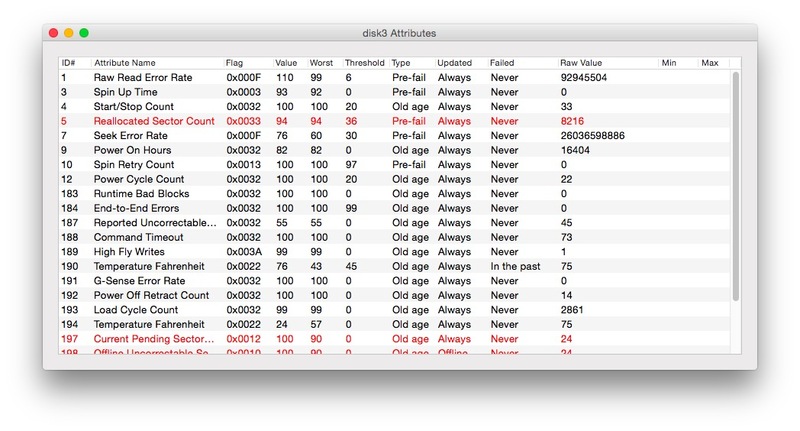 The attributes can be used to detect when a hard drive is having mechanical or electrical problems, and can indicate when the hard drive is failing. SMART Utility can read and display these attributes. This allows time to hopefully backup, and then replace the drive. 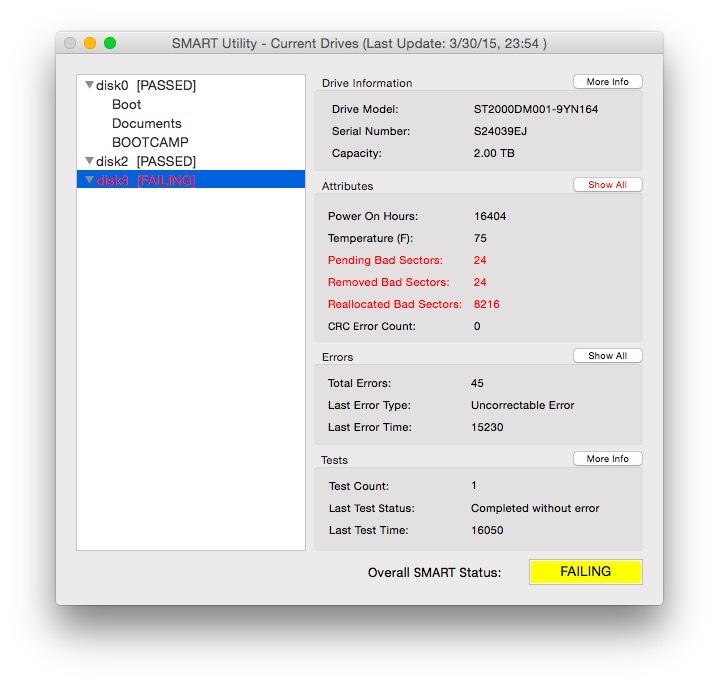 SMART Utility also allows running a drive’s built in self test, which can also indicate malfunctions on the drive. 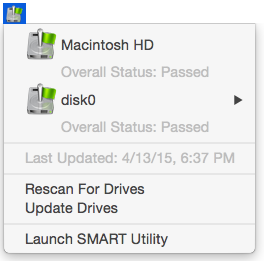 SMART Utility is different from other drive utilities, such as Disk Utility, which only read the overall SMART Status. SMART Utility not only displays the individual attributes to see their status and information, but it also uses an internal algorithm based on those attributes to detect drives failing before SMART indicates it has failed. 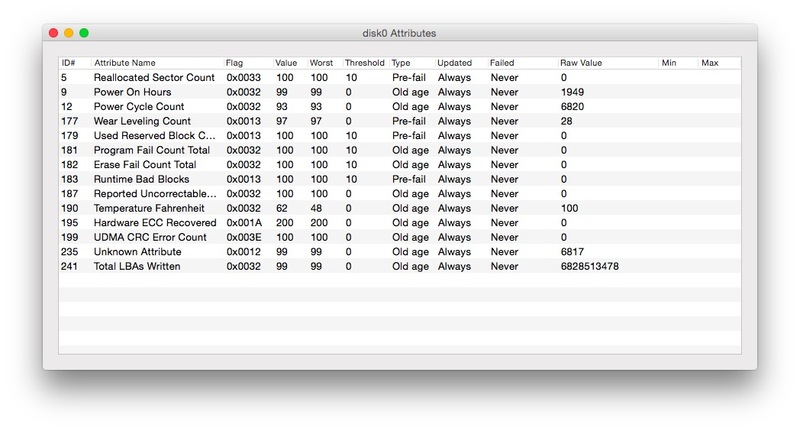 This pre-fail detection can save precious data before SMART has determined that the drive has failed. And, while the raw information can be viewed on the command line with smartmontools (which is what SMART Utility is based on, SMART Utility presents it in an easy to read format, as well as running its internal pre-fail algorithm. Plus, with the ability to run self tests, problems can be detected even sooner. View the FAQ that is also available in the app under the Help menu. Note: SMART Utility is based on the command line “smartmontools”, an open source software package that does the actual scanning of SMART attributes. SMART Utility only parses the data that smartmontools outputs, and it would not exist without it. It is available on their site. SMART Utility Version 4.0 Coming Soon! To answer the questions we often get- SMART Utility Version 4.0 is coming soon. Work is still progressing, it has just been slower than expected. Please stay tuned for the release. And remember, purchase now and the upgrade will be free!